Statue.com has built a long reputation of making beautiful, timeless custom sculptures. 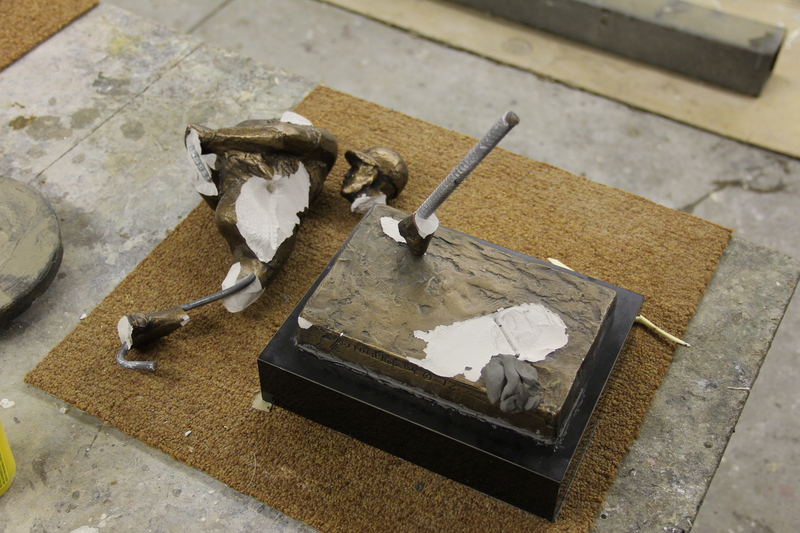 However, did you know we have been repairing and restoring sculptures just as long? Our expertise is not limited to one material. 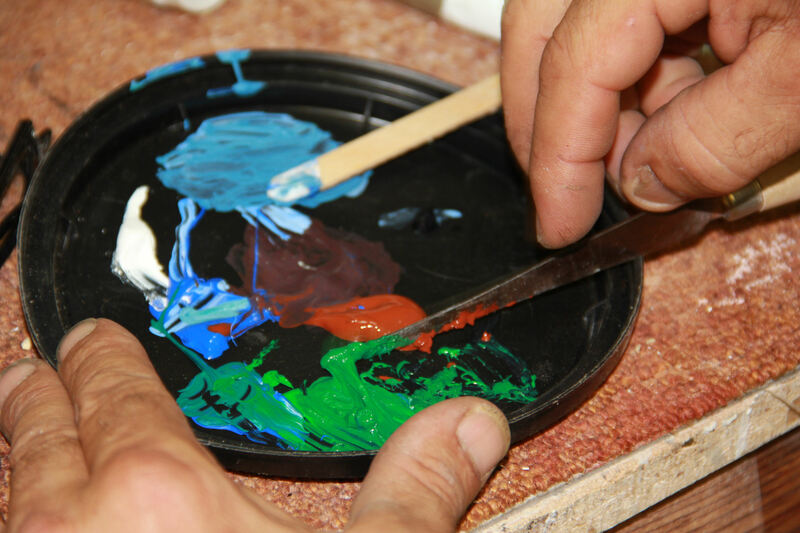 Whether we are working with plaster, cement, alabaster, marble, fiberglass or bronze; our restorations will have your sculpture refinished or repainted to their original state. 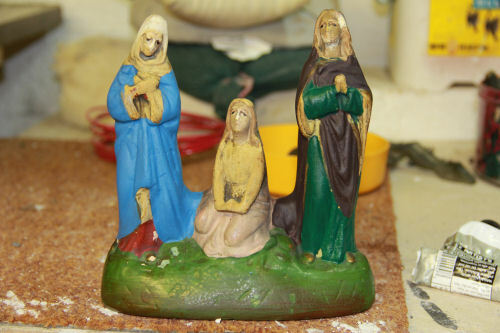 Furthermore, we can fix broken fingers, chipping paint, and cracks in weathered or statues that have been broken . Resin, plaster, marble, concrete, wood, and stone statues are carefully re-worked in our shop so that in most cases they will appear as original, and often are reinforced to be stronger than before. 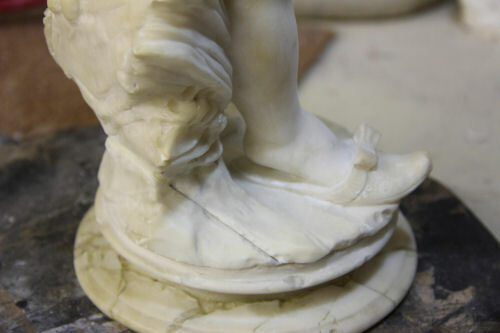 This week we will be featuring two more blogs on statues we have repaired and refinished, so stay tuned! In the meantime head on over to Statue.com to see our entire gallery of sculptures, fountains and garden statues. If you have something in mind but cannot find it on the website, feel free to contact us. Our excellent products coupled with our outstanding customer service ensures Statue.com is the best online store for statuary and other fine goods. Statue.com fans, do you remember when we restored this statue a year and a half ago? It was one of our most rewarding projects. Have a statue or fountain needing to be restored? We would love to help!Head on over to our website for more information. You can reach us by phone Monday through Friday 8:00 a.m. to 6:00 p.m. (CT) 618-692-1121 or Toll-Free at 877-675-2634. Send us snail-mail love to: Statue.com, Inc., 100 N. Main St. Edwardsville, IL 62025. Throughout history religious statuary has been used in decorating homes, schools, and places of worship. They did see there highlighted year in the 20’s and 30′ companies where creating plaster religious sculptures from life- size to small religious statuary. One of the companies I have studied and collected for years is the Daprato Company of Italy. They moved to Chicago and New York and had a large collection of molds and replicas of all kinds of Religious Figures, Angel Statuary, Jesus and Mary statue of hundred of styles, sizes and church artifacts. In fact being an early on EBay shopper I was able to obtain about sixty of the Architectural hand painted drawings of the Daprato Company. These where all hand drawing, hand colored mock ups of Churches and their interiors. Daprato was hired to come in and design Catholic Churches that hired them. They would design the whole interior including Statuary, Stained glass window designs which I have a few drawing of in my personal collection. They would present these architectural drawings to the Priest for their approval of the plans and upon approval Daprato Company finish the work needed to complete the church interiors. Being a Roman Catholic I was able to purchase the actual architectural drawing of my Church, that I was baptized, confirmed, married and my children where baptized there as well. And I would say that I am honored to own this arcthictural drawing that of the Parish I grew up in and is one of my prized possessions of art work that hangs in my home. Other than my paint by numbers Last Supper painted by my Great Uncle which I consider priceless. What I have heard over the years is that in the 50’s and 60’s those Churches received a letter from the Pope to stop using replicas and statuary in Churches. That they where going to be more modern or contemporary and not to have statuary represent the Church. Or may be more minimalist in style so many of the priests had the statuary thrown away or place in the basement of the churches. This is where many of the statues ended up and became damaged in the basements of churches. Water damage is what we seen here at Statue.com in our repair department with peeing paint and deteriorating plaster from being in the damp basements. Over the past years we have restored and repainted many of these sculpted statuary for this famed Company. Soon after this letter or the Parishes we notified of this, all statuary purchase stopped with the Daprato Company and sadly they closed. What I have heard is that many of the molds where just thrown away and art was lost. Being maker of statuary for most of my life time and this happened a little before I was born still moves me of what a tragic lose of an icon in the statuary business. What I would have done to save all those molds and rich décor of historical religious artifacts. Now we do see these sculptures come up for auction and needs repairs and Statue.com is proud to offer many makers of Religious sculptures. Come view our vast collection of Religious Statuary at http://www.statue.com/Products/Religious/ where you can still find some very fine Catholic Statuary. Statue.com repair services and restoration project. For more sales or information about all statuary come visit us at www.Statue.com for all your statuary needs. You can e-mail us at Sales@statue.com or call us at 618-692-1121 or Toll-Free at 877-675-2634. We are now on the finishing of marble / alabaster restoration and repair of this little girl statue. We use a clear epoxy and blend it with marble dust to make a think consistency and we then bond and fill in the broken parts of the statue. Remember we can do this but the statue has be drilled and pinned together with thick copper wires. So this making the statue already stronger and then we add the epoxy. Of it dries we give it a day or two and then we begin the sanding and grinding to make the seams seamless. This takes some technical and artist skills, you do not want to take too much off or too little. It has to be just the right amount of sanding so the sculpture is restored to original state. Statue.com will be adding photos of this process as we blog. Or visit us at www.Statue.com to see more. Statue.com has been repairing and restoring statuary since 1996 and have the largest collection statuary on our web site a www.Statue.com. We are always repairing sculptures and we have one we just finished up. 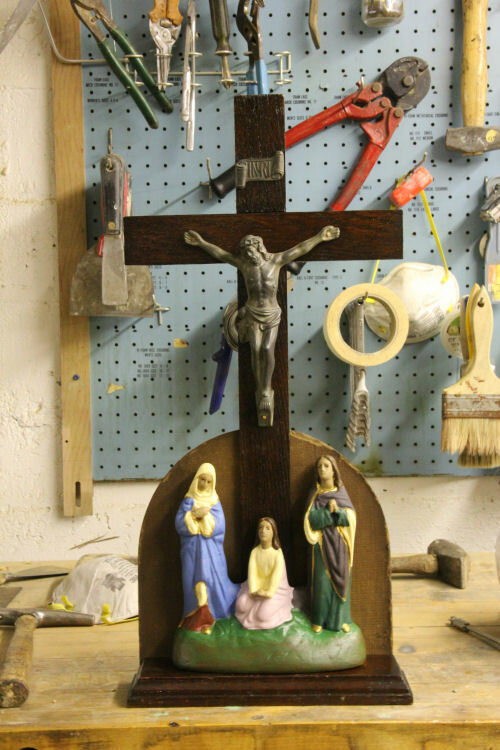 Many of our repairs and to hands and fingers of religious figurines life-size sculptures to small figurines. We patch holes and cracks and at Statue.com we pride our repair and restoration work to make them stronger and better than the original. Statue.com artisan take pride and care with each sculpture that comes into our fix it shop. Our artist and sculptors can repair just about any material a statue is made such as marble, alabaster, plaster, bronze, brass, metal and even wood sculptures. Actually I do not think there is a sculpture we where not able to fix, repair or restore. If you have any questions about a repair please feel free to contact us at sales@statue.com or call us Toll Free at 877-675-2634. Here is a small sample of what we do and there will be more to come from our Statue.com department. Statue.com welcomes the Olympic Games and History about sculptures related the games. A Modern Discus Thrower also know as Contemporary Discobolus Sculpture can be found at www.Statue.com. The Olympic Games were first held in the year 776 B.C. In July of every fourth year men came together from all over the Greek world to participate in the athletic contests. Although there was great rivalry and intense competition among the athletes and their sponsoring city-states, the sacred games established a spirit of friendship and unity. Before the opening of each festival a sacred truce was called; throughout the land fighting ceased. The games continued at Olympia until their abolishment by the Emperor Theodosius in 394 A.D., more than one thousand years after they had been established. In 1896 the tradition was resumed. The participating nations felt that it was appropriate that the revival should take place in Greece where the games first took place. The great stadium in Athens was modernized for the event and a contemporary statue of a discus thrower by Dimitriades was placed directly facing the stadium. Throwing of the discus had been, as it is today, one of the five events of the original pentathlon. A Modern Discobolus was inspired by that of Dimitriades to reaffirm the ancient Greek belief that the body of man is glorious, as is his spirit.